The day of Saturday, Nov. 10, was an eventful one for the African American Arts Institute (AAAI). An institute supported by the Office of the Vice President for Diversity, Equity, and Multicultural Affairs, the African American Arts Institute spent the weekend welcoming members of the community to two key events: the dedication of the institute’s dance studio floor to Professor Emerita Iris Rosa and the 25th Annual Potpourri of the Arts. Throughout these events, the African American Arts Institute celebrated a heritage of excellence in performance that stretches back decades—hand one that continues into the future. The day’s events began with a chance to reflect upon the legacy of a remarkable educator whose work helped make the African American Arts Institute’s work possible. To kick off the day, members of the Indiana University and Bloomington communities gathered in the Neal-Marshall Black Culture Centerto officially dedicate the center’s dance floor to Iris Rosa, professor emerita of African American and African Diaspora Studies and founding director of the African American Dance Company. As founding director, Rosa taught at Indiana University for over four decades before retiring in 2017. Over the course of those decades, she fundamentally shaped the direction of the African American Dance Company and helped introduce thousands of students to the dance traditions of the African diaspora. 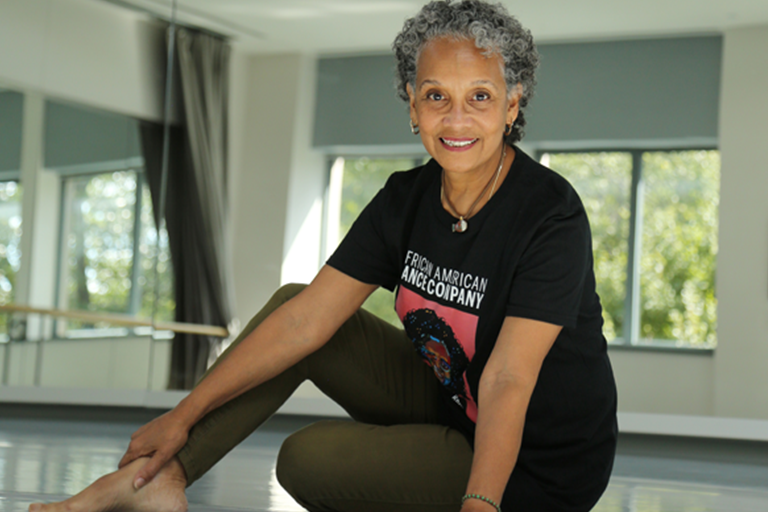 Thanks to a gift from the Indiana University Black Philanthropy Circle, the dance floor upon which the African American Dance Company practices will bear her name in honor of this legacy. "As co-chair of the Black Philanthropy Circle, I know I speak for all of our members when I emphasize just how excited we were to make the dedication of the Iris Rosa Dance Floor possible,” said James C. Wimbush, vice president of Diversity, Equity, and Multicultural Affairs, dean of The University Graduate School, and Johnson Chair for Diversity and Leadership. “Saturday's dedication ceremony brought together the wide community Professor Rosa has impacted through her decades of teaching at Indiana University—a true testament to her powerful work as an educator and mentor to generations of students." Rosa, who attended the Potpourri celebration and presented on the history of the African American Dance Company at the floor dedication, found the day’s events particularly special. In addition to showcasing the talent and hard work of the student ensembles and their directors, she said, the day’s events gave attendees an unparalleled look at the history and ongoing legacy of a remarkable artistic institution. “Many people only see the end product, but are not quite sure about the journey,” Rosa said. The heritage of excellence exemplified by Rosa’s career was also on display throughout the AAAI’s 25th annual Potpourri of the Arts performance, held in the IU Auditorium Saturday evening. Featuring the three ensembles within AAAI—the African American Dance Company, IU Soul Revue, and the African American Choral Ensemble—the evening showcased performances of material from across the African American and African diaspora, including everything from traditional African dance to hip-hop and renditions of music from the film Black Panther. By and large, the students who performed as part of Potpourri are not pursuing careers in music, but have used the ensembles to explore a passion for performance that transcends their formal academic interests. It is this factor, combined with the high degree of diversity present within the ensembles, the material they perform, and the audiences they entertain, that makes Potpourri such a special experience, according to Dr. Charles Sykes, executive director of the African American Arts Institute. “The Black experience is embraced and engaged with by people from a broad range of backgrounds. That’s something that I think is really special not only about Potpourri, but also everything that we do [at AAAI],” Sykes said.